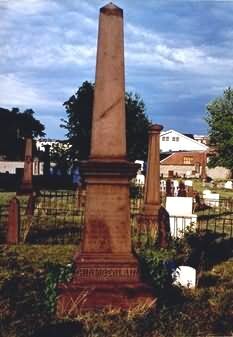 E. L. H. Chamberlain grave, Middletown, Connecticut—White Estate. While at Topsham we received a letter from Brother Chamberlain of Connecticut, urging us to attend a Conference in that state in April, 1848. We decided to go if we could obtain means. My husband settled with his employer, and found that there was ten dollars due him. With five of this I purchased articles of clothing which we much needed, and then patched my husband's overcoat, even piecing the patches, making it difficult to tell the original cloth in the sleeves. We had five dollars left to take us to Dorchester, Massachusetts. Our trunk contained nearly everything we possessed on earth; but we enjoyed peace of mind and a clear conscience, and this we prized above earthly comforts. In Dorchester we called at the house of Brother Nichols, and as we left, Sister N. handed my husband five dollars, which paid our fare to Middletown, Connecticut. We were strangers in that city, and had never seen one of the brethren in the state. We had but fifty cents left. My husband did not dare to use that to hire a carriage, so he threw the trunk up on a pile of boards, and we walked on in search of someone of like faith. We soon found Brother C., who took us to his house. The Conference was held at Rocky Hill, in the large, unfinished chamber of Brother Belden's house. The brethren came in until we numbered about fifty; but these were not all fully in the truth. Our meeting was interesting. 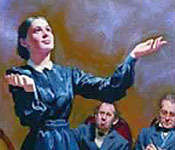 Brother Bates presented the commandments in a clear light, and their importance was urged home by powerful testimonies. The word had effect to establish those already in the truth, and to awaken those who were not fully decided. We were invited to meet with the brethren in the State of New York the following summer. The believers were poor, and could not promise to do much toward defraying our expenses. We had no means with which to travel. My husband's health was poor, but the way opened for him to work in the hayfield, and he decided to make the effort. It seemed then that we must live by faith. When we arose in the morning, we bowed at our bedside and asked God to give us strength to labor through the day. We would not be satisfied unless we had the assurance that the Lord heard us pray. My husband then went forth to swing the scythe, not in his own strength, but in the strength of the Lord. At night, when he came home, we would again plead with God for strength to earn means to spread His truth. We were often greatly blessed. In a letter to Brother Howland, July, 1848, my husband wrote: "God gives me strength to labor hard all day. Praise His name! I hope to get a few dollars to use in His cause. We have suffered from labor, fatigue, pain, hunger, cold, and heat, while endeavoring to do our brethren and sisters good, and we hold ourselves ready to suffer more if God requires. I rejoice today that ease, pleasure, and comfort in this life are a sacrifice on the altar of my faith and hope. If our happiness consists in making others happy, we are happy indeed. The true disciple will not live to gratify beloved self, but for Christ, and for the good of His little ones. He is to sacrifice his ease, his pleasure, his comfort, his convenience, his will, and his own selfish wishes for Christ's cause, or never reign with Him on His throne." The means earned in the hayfield was sufficient to supply our present wants, and also pay our expenses to go to western New York and return. Our first Conference in New York was held at Volney, in a brother's barn. About thirty-five were present—all that could be collected in that part of the state. But of this number, hardly two were agreed. Some were holding serious errors, and each strenuously urged his own views, declaring that they were according to the Scriptures. These strange differences of opinion brought a heavy weight upon me, as it seemed to me that God was dishonored; and I fainted under the burden. Some feared that I was dying; but the Lord heard the prayers of His servants, and I revived. The light of heaven rested upon me, and I was soon lost to earthly things. My accompanying angel presented before me some of the errors of those present, and also the truth in contrast with their errors. These discordant views which they claimed to be according to the Bible were only according to their opinion of the Bible, and they must yield their errors and unite upon the third angel's message. Our meeting closed triumphantly. Truth gained the victory. The brethren renounced their errors, and united upon the third angel's message, and God greatly blessed them and added to their numbers. From Volney we went to Port Gibson to attend a meeting in Brother Edson's barn. There were those present who loved the truth, but were listening to and cherishing error. The Lord wrought for us in power before the close of that meeting. I was again shown in vision the importance of the brethren in western New York laying aside their differences, and uniting upon Bible truth. We returned to Middletown, where we had left our child during our western journey. And now a painful duty presented itself. For the good of souls we felt that we must sacrifice the company of our little Henry, that we might give ourselves unreservedly to the work. My health was poor, and he would necessarily occupy a great share of my time. It was a severe trial, yet I dared not let the child stand in the way of my duty. I believed that the Lord had spared him to us when he was very sick, and that if I should let him hinder me from doing my duty, God would remove him from me. Alone before the Lord, with most painful feelings and many tears, I made the sacrifice, and gave up my only child, then one year old, for another to exercise a mother's feelings toward him, and to act a mother's part. We left him in Brother Howland's family, in whom we had the utmost confidence. They were willing to bear burdens to leave us as free as possible to labor in the cause of God. We knew that they could take better care of Henry than we could while journeying, and that it was for his good to have a steady home and good discipline. It was hard parting with my child. His sad little face, as I left him, was before me night and day; yet in the strength of the Lord I put him out of my mind, and sought to do others good. Brother Howland's family had the whole charge of Henry for five years.